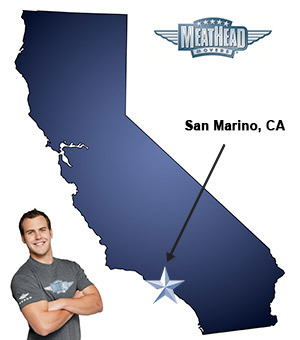 For a trouble-free move to San Marino, Meathead Movers is the company for you! Our professionally trained student-athlete movers are ready to get you into your new San Marino home. From its botanical gardens to the vibrant landscaping of the local community, San Marino offers scenic beauty all around. Moving to San Marino doesn’t require a lot of work when you let Meathead Movers do the heavy lifting for you. Our experienced crew of San Marino movers includes student-athletes who move your belongings with care and diligence. San Marino residents pride themselves on their serene landscape and low crime rate. Lacy Park, which lies in the middle of the city, consists of a 30-acre lot with lush open fields and plenty of trees. It also has a dedicated picnic area where city events, festivals, music concerts and other activities take place. The city also has a variety of popular landmarks, such as the Huntington Library, Art Collections, and Botanical Gardens. From speakeasies to dance clubs, San Marino has an active nightlife scene as well. In addition, it has champagne bars, jazz and blues clubs, karaoke lounges, and sports bars for a night out on the town. For even more action, head up the road into Pasadena for the annual Rose Bowl, or travel a few miles southwest into Los Angeles for an endless array of activities. When you’re ready to make the move, let Meathead Movers handle the load. Our experienced San Marino movers specialize in all aspects of moving, starting with packing or storage and including local and long distance moves. We can also be contracted to conduct on-site relocations and any number of commercial moves. We differ from the average moving company by staying active in the community; offering incentive programs; and hiring smoke-free, drug-free, intelligent student athletes who take pride in what they do. Even with long-distance moves, you work with the same movers at both ends for added confidence and security. San Marino offers the ideal place to work, play, and raise a family, and Meathead Movers wants to help make your move as convenient as possible. Choose us as your San Marino movers team and enjoy a hassle-free way of moving to your new city. Contact Meathead Movers today for a free no-obligation moving quote. Moving to San Marino? Here are some helpful resources. “Sylvia and I wanted to take a moment to thank you and the great team from Meathead Movers for a phenomenal moving experience. The team of Lance, Mike, Manny, Erin, & Emerson was a well-oiled group of professionals who worked very well together. The men were amazingly strong, exceedingly polite, exceptionally efficient and quintessentially professional throughout every aspect of the move, from the preparation to the loading to the last item unloaded. We cannot say enough good things about this fine team and we thank you for our first and only positive moving experience. This team set a new gold standard for professional movers. Please consider us an enthusiastic referral source for Meathead Movers – you offer a great business model that works for everyone involved. View more San Marino resources.